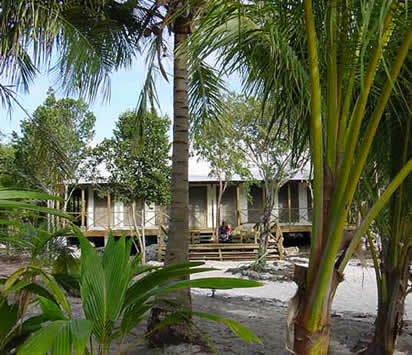 Tiamo Resort is a nature lover's paradise located in the pristine natural surroundings of South Andros, The Bahamas. Winner of several international eco-tourism awards, Tiamo is 100% solar powered, has utilized green building practice, non-intrusive water management practices and focuses on passive recreation to maximize guest¹s appreciation for the sensitivity and fragility of the surrounding environment. 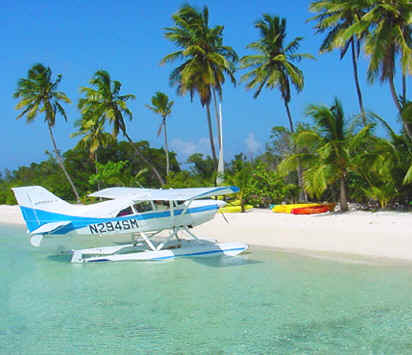 Even before you arrive at Tiamo, you begin to experience the natural beauty of South Andros. A pleasant, picturesque, fifteen-minute boat ride takes you through the waters of South Bight to a private, white sand beach that welcomes you to Tiamo Resort. The main lodge is the "Heart of Tiamo." Here you will gather to eat, drink and socialize with other guests. They have an excellent choice of great wines and top-shelf liquors from a well stocked bar. Special attention is given to every meal. Fresh, local seafood is prepared with a Caribbean flare and served by candlelight on white linen tablecloths. Situated on a secluded beach, amidst coconut palms and sea grape trees, are eight individual bungalows furnished with comfortable and appealing appointments. Designed in the spirit of South Andros and built in the traditional Caribbean style, each is privately spaced and raised up to greet the incoming sea breezes. Daily Maid Service, Full Breakfast & Lunch, Snacks & Hors D'oeuvres, 5 Star Dinner, Water Sports and Airport Transfers. Snorkeling, Kayaking, Guided Kayaking Trips, Sailing, Sailing lessons, Nature Walks, Swimming. make your vacation arrangements now!